First time real drive on express way in Japan going to Nikko in Tochigi. We started from Yokohama , from Bay bridge on Saturday , moving towards Nikko. We 2 on Dyna and R-1 , riding at speed of 100 + . It was planned to be there around in 2 hrs but actual time was more than 5 hrs to Nikko on the top. Stopped 2 places on the highway , had ice cream in this hot and humid weather , though it was cloudy so got safe. Started at 8 am , reached on top near fall around 1:30 pm. Though we were not on run , just taking rest slowly moving to destination. First time ride at 140Km/hr , on straight road but not that empty. Left Nikko at 2:30 , went to top of mountain to see Lake Chuzenji , stopped for awhile , move back to down , stopped by Shrine famous for 3 monkeys. Entry fee was 1500 Yen , so didn't got that courage to enter inside it. Took some photos and moved to our hotel in Ibaraki Prefecture , was only 3900 Yen for 2 persons. It was around 100 Km from Nikko , reached there around 6:00 pm. The hotel name was Prince Hotel , it was not that bad to live in. Took rest and went to drink in night. We couldn't find even single convenience store, that was the most surprising aspect. Eat and drink , came home around 10 , and sleep long. Left from our hotel at 10:00 am , towards home , in between went to my friends relative house in ibaraki , a total countryside place near green fields. 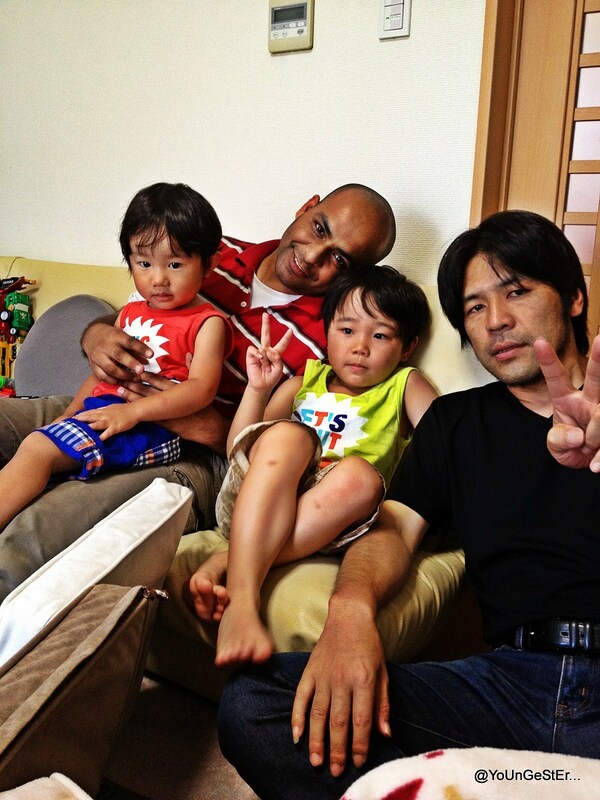 Reached there around 11:30 , then eat , talk and play with there 2 young boys 5 & 3 yr old. Left for home around 5pm , took 2 hrs without highway this time and was home around 7:00. 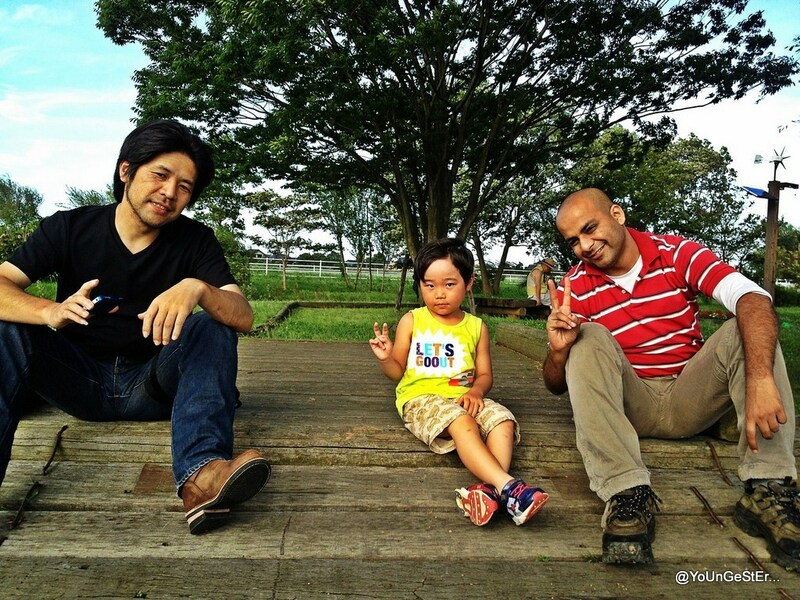 Long journey of more than 400 Kms , From Kanagawa , Tochigi , Ibaraki and Tokyo prefecture. YZF-R1 , Starting point from Yokohama. Another Stopover , though forgot the name of the place. Finally Nikko , time to run to top of mountain , zigzag road...quiet dangerous one.. This famous road connects Lake Chuzenji with the town of Nikko down in the valley. It ascends more than 400 meters and is named "Iroha Slope" because its original 48 turns (now there are only 30) were equal to the number of characters in the Japanese syllabary, formerly referred to as "iroha"
Located at the top of the Irohazaka Winding Road, shortly before reaching Lake Chuzenji, the Akechidaira Plateau is a small parking lot with panoramic views over the winding road and the valley below. A ropeway lifts visitors in three minutes from the parking lot to an observation platform with views of Kegon Waterfall in combination with Lake Chuzenji. The almost 100 meter tall Kegon Waterfall (Kegon no taki) is the most famous of Nikko's many beautiful waterfalls. It can be viewed free of charge from an upper observation platform or from an observation platform at the waterfall's base. 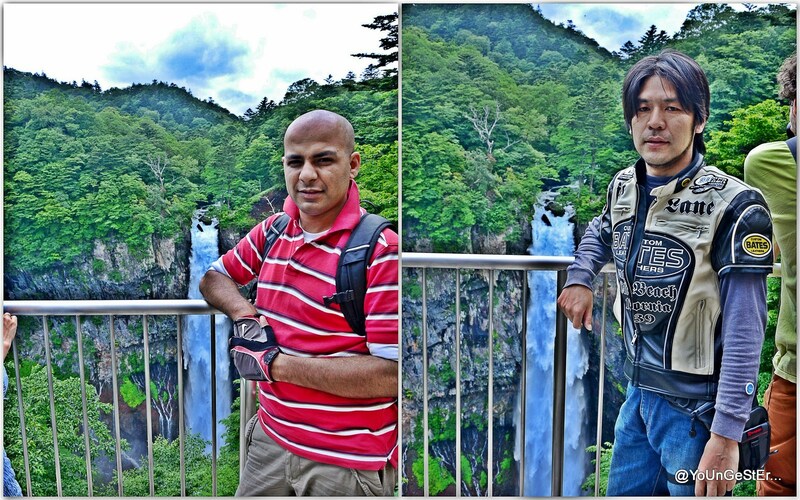 The Kegon Waterfall (Kegon-no-taki [華厳の滝]; also Kegon Falls) is the star natural attraction of the World Heritage-laced Nikko area as far as we were concerned. Indeed, much of the attention goes to the Toshogu Shrine, Rinnoji Temple, Taiyun Mausoleum, etc. which showcase some well preserved wooden temples that have earned it UNESCO World Heritage status. However, just out of town (reachable by the pretty convenient buses and relatively reasonably priced All Nikko Pass), we were able to make our way into the mountains near the Chuzenjiko (Lake Chuzenji), which drained into the towering 97m Kegon Waterfall - easily considered one of Japan's top 3 waterfalls. Karokke , Nikko`s famous one for 300 Yen. Inside is Gyoza ..its good to try..
Mt. Nantai is also called Mt. Futara, and the name of Futara is derived from Potalaka in Sanskrit. Also, Futara can be divided into two Japanese words. One is futa, which means two in Japanese, and another word is ara, which means storm. The meaning of combination of those two words are two storms. According to a legend, god of wind and god of thunder appear at Byoubuiwa rocky screen and bring the two storms a year. Moreover, Futara can be pronounced Nikoh in another way of reading. You can imagine that the Nikoh became Nikko later. Landscape of Oku-Nikko has been created dramatically by natural environment like an eruption. Lake, waterfall, grassy plain and marshland are gathered like a miniature garden. Nature has been remained its natural appearance since Oku-Nikko was designated as a National Park in 1934. Weather of Oku-Nikko is relatively cold, but it is comfortable to spend the summer. Lake Chuzenji (Chuzenjiko) is a scenic lake in the mountains above the town of Nikko. It is possible to hike around the entire 25 kilometer circumference of Lake Chuzenji via hilly lakeside walking trails. Alternatively, the lake can be enjoyed from sightseeing boats that depart from Chuzenjiko Onsen. Lake Chuzenji (Chuzenjiko) is a scenic lake in the mountains above the town of Nikko. Chuzenjiko Onsen is a touristy hot spring resort town at the eastern shores of Lake Chuzenji and at the foot of Mount Nantai. The small town consists mainly of souvenir shops, hotels and ryokan, but also offers some sightseeing spots, including Chuzenji Temple, a Futarasan Shrine, a nature museum and, most of all, Kegon Waterfall. It is also the departure point of sightseeing cruises of the lake. Under Construction ..entry fee 1000 Yen. Futarasan Shrine honors the gods of Mt. Nantai (Mt. Futara), a peak to the west of Nikkō. The trio of gods includes Nantai, the god of the mountain, his consort, Nyotai, and their child, Taro. In the "Shinkyusha (sacred stable)" for the horses serving God, there is a series of 8 carved boards on which the life of a monkey is illustrated, from birth to pregnancy, caricaturing human life. One of the sculptures, the "Three Monkeys", is famous throughout the world for the "see no evil, hear no evil and speak no evil" poses. The carved monkeys covering their eyes, ears and mouth, respectively, were inspired by the Buddhist teaching that if we do not hear, see or speak evil, we ourselves shall be spared from evil, and the theme was chosen here in the belief that the monkeys would protect the horses from disease. Time to leave hotel , there was small temple in front of it though.. Map is here...4000 Yen for 1 room.